Liberia: Is President Weah Being Dishonest about The Private Jet? Monrovia – The inclusion of a presidential pilot on President George Weah’s 24-man delegation to the inaugural ceremony of Senegal’s President, Macky Sall, is awakening suspicions that President Weah secretly owns a private jet, though he claims innocence to the allegation and says his initial use of the jet was a good will gesture of a wealthy. 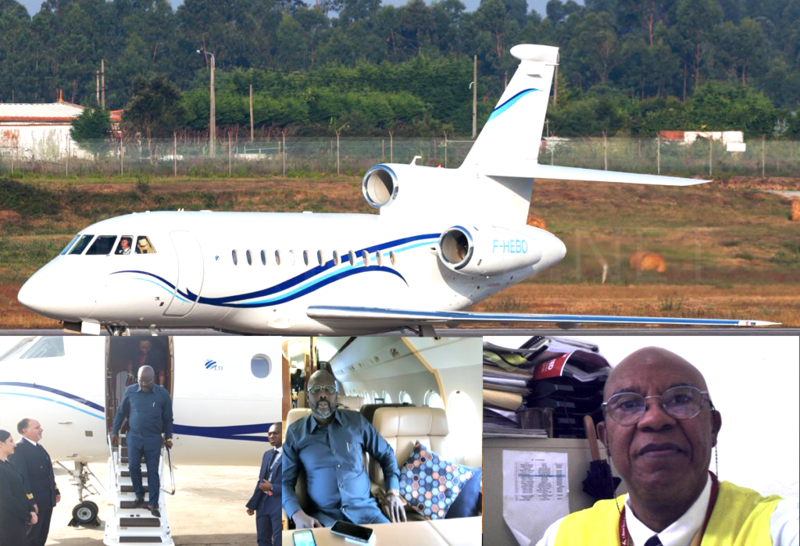 The jet with tail number F-HEBO was first spotted at the Roberts International Airport shortly after Weah was inaugurated as President in January 2018. “The airplane they are talking about is for my friend, who is the manager of a big company in Burkina Faso. He told me to use it anytime I want to travel because he has seen me use planes owned by Ivory Coast and others. He wants me use a plane that is not labeled to boost my moral, too,” Pres. Weah added. The wealthy Burkinabe friend of the President turned out to be Mahamadou Bonkoungou, CEO of EBOMAF, a construction company in Burkina Faso that was seeking a US$420 road financing contract with Liberia. To date, the status of the financing agreement remains unknown. Some political pundits have called the agreement which was signed into law a fiasco. But the President continues to be spotted in the private jet on several occasions, especially when he is returning from his foreign trips. Amongst the President’s 24-man delegation is Captain Moses K. Weefur who carries the title of ‘Presidential Pilot’ on the delegation. His significance on the delegation in the absence of an official presidential plane for the President is unknown. A top official at the Executive Mansion who asked for anonymity told FrontPageAfrica that selecting who travels with the President is strictly at the President’s discretion. “Captain Weefur, to the best of my knowledge, always travels with the President. He’s always on the delegation. I do not the technical details involved or why he’s often on the delegation,” the source said. Reacting to the presence of presidential pilot on the delegation, the secretary general of the former ruling Unity Party, Mo Ali, reacted, “Why is he carrying a pilot, does he have a plane? He’s just giving credence to the allegation that he has secretly purchased a plane. Also speaking to FrontPageAfrica, Abraham Darius Dillon, the vice president for operations of the opposition Liberty Party it is ironical that President Weah who does not have a private jet would have a presidential pilot on his delegation. To him, this is a confirmation that President Weah has purchased Mr. Bonkoungou’s private jet. “Madam Ellen Johnson Sirleaf was in power for 12 years and made several trips but she never travelled with a presidential pilot because she didn’t own a plane. President Weah is traveling with presidential pilot because he owns a private jet,” Dillon told FrontPageAfrica. He is of the strong opinion that the President keeps jet in Senegal because of the good relationship between him and President Sall of Senegal. “Even if President Weah leaves the country on a commercial flight. He always returns on that particular private jet, that’s why we said he has used tax payers’ money to buy himself a plane,” he added. It can be recalled that as part of their reaction to President Weah’s State of the Nation address in January, leaders of opposition political parties alleged that the Weah-led administration had acquired the private jet to facilitate the President’s foreign travels. They said the aircraft was purchased with money from government’s coffers. “That aircraft is kept abroad to avoid any possible public backlash. They want you to believe the aircraft belongs to a ‘friend’. “This is false! There is no wealthy person anywhere in the world to be so ‘generous’ as to allow the leader of any nation use their aircraft for every travel. Who bears the cost of maintaining such an aircraft? The President may be thinking that you have no way of determining if the aircraft he flies in regularly was purchased last year. That was part of the criminal loan deals that the president struck last year against growing public outcries,” said Mr. Wilmot Paye, Chairman of the Unity Party on behalf of his colleagues in the opposition.